Having grown up together in a small Virginia town, Olivia Stallard and William Jack Davis II had known each other for nearly their entire lives before they walked down the aisle. “My father was his peanut football coach in elementary school and I was the cheerleader,” reminisces Olivia. “That is where it all began.” As their childhood friendship transitioned into romance, Jack was certain that he wanted to spend the rest of his life with Olivia. When the time came to propose, it was important to the groom that he ask his bride-to-be’s parents for their blessing. 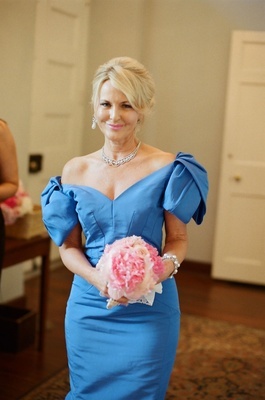 “I simply explained to them that I love their daughter and have loved her since I was 10 years old,” declares the groom. 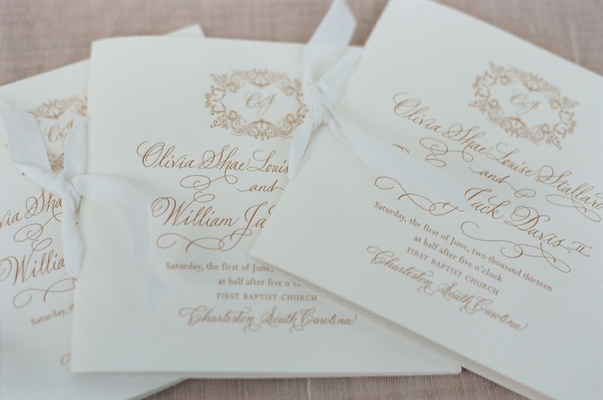 The couple selected Charleston, South Carolina for the location of their summer destination wedding. The quaint, Southern city not only reflected both the bride and groom’s personalities, but it provided an equal distance between Virginia and Florida, where most of their 250-person guest list would be traveling from. “We wanted our guests to have the opportunity to kick off the summer with a fun celebration in a beautiful city,” professes Olivia. 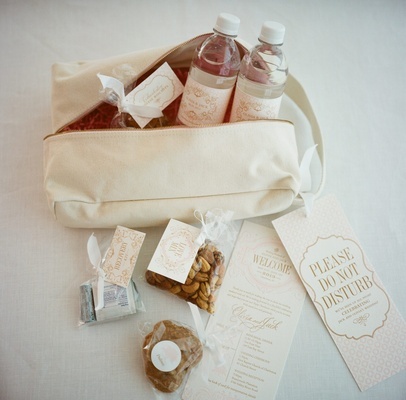 Welcome bags filled with Southern favorites were delivered to guests’ hotels to start the weekend off right. 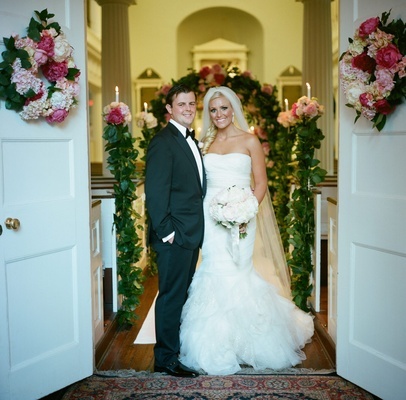 A historic church in downtown Charleston set the stage for the classic ceremony. “Jack and I knew we wanted a church wedding,” affirms the bride. The pastor of Olivia’s childhood church, who also baptized her, officiated the ceremony. 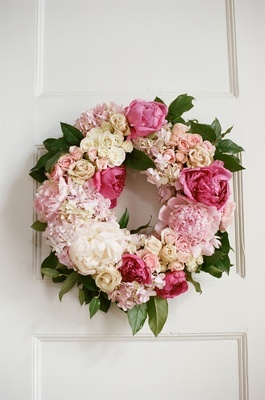 As guests walked through the front doors of the sanctuary, flower wreaths and floral arches adorned with peonies, roses, sweet peas, hydrangeas, and additional blooms in hues of cream and pink welcomed them into the romantic setting. 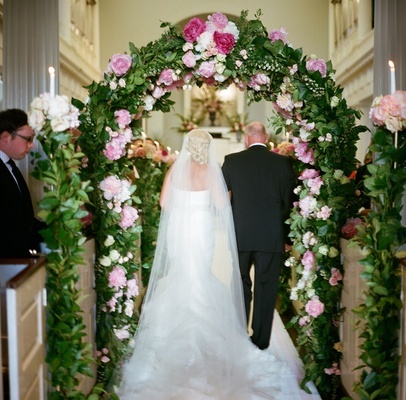 A custom, monogrammed aisle runner with light pink edging ensured the ceremony décor was personalized from floor to ceiling. 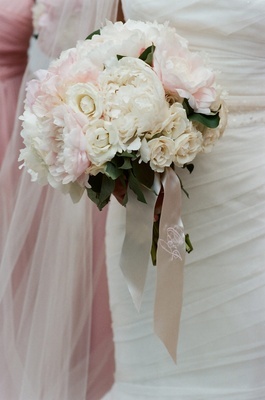 Olivia was radiant in a strapless, alabaster mermaid gown and held a bouquet comprised of peonies, roses, sweet peas, and ranunculus blossoms in hues of pale pink and vanilla, hand tied with a monogrammed satin ribbon; her maid of honor carried a smaller arrangement of the same florals. 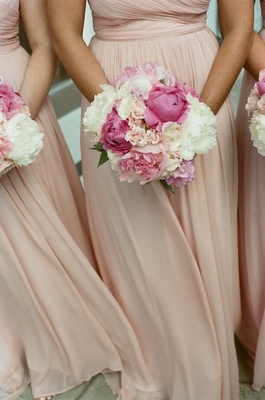 Bridesmaids were dressed in blush floor-length sheaths with wrapped bodices and held similar hand-tied bouquets with blooms in deeper shades of pink. 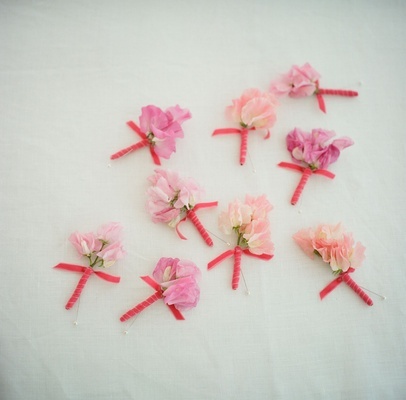 Jack and his groomsmen were dapper in black-tie attire with boutonnieres fashioned from pink blossoms, hand tied with cerise ribbons. 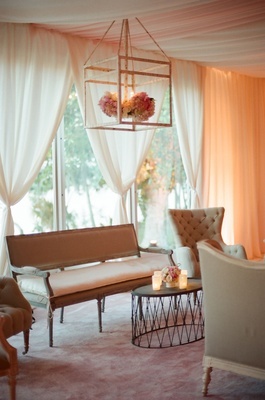 The cocktail hour was designed to resemble a vintage lawn party out of The Great Gatsby,complete with sofas, cocktail tables, and chandeliers suspended from trees. 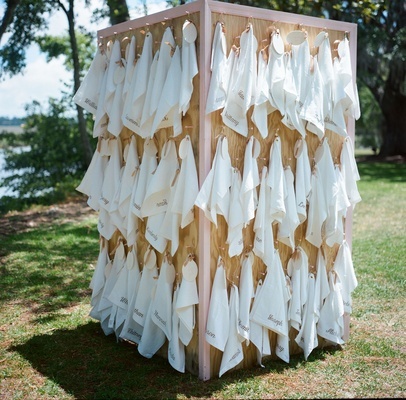 As an ode to Jack’s profession and the couple’s love of golf, guests were invited to practice their swings at a makeshift driving range dubbed “Tee Off in Tuxes” by hitting biodegradable golf balls into the river. 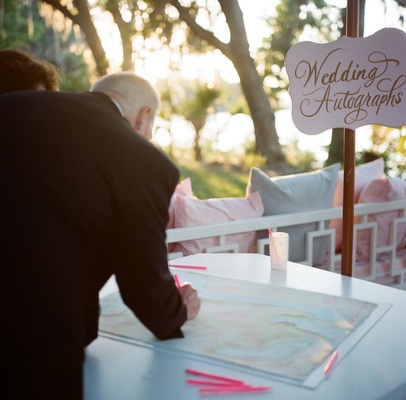 Seating assignments were discovered on golf towels embroidered with guests’ names, and table numbers fashioned from customized golf flags were displayed on dinner tables. “Incorporating golf-related themes into the wedding made our event unique and reflected what we enjoy doing perfectly,” says Jack. 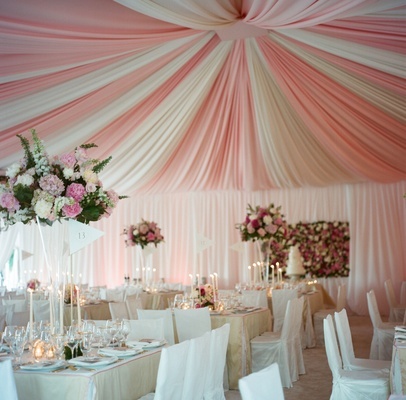 Marking the reception space was a dramatic pink-and-white striped tent featuring chandeliers suspended from overhead panels embellished with florals. 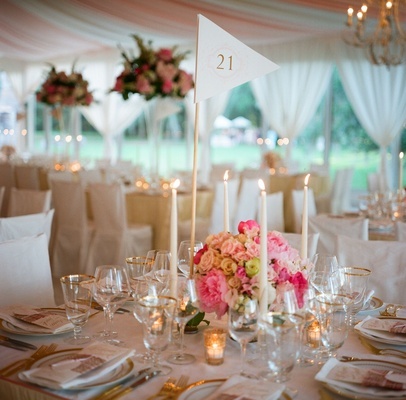 In the dining area, custom linens in white and cream with pink piping bedecked each table. 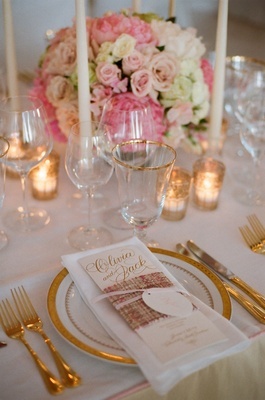 Gold accents added a royal ambience to the tablescape: Crystal goblets, china, flatware, and candle votives all incorporated the metallic hue, while tall ivory candles emitted a golden glow for the sit-down dinner service. A blend of high and low centerpieces graced tables, each overflowing with bunches of flowers used in the ceremony – peonies, roses, ranunculuses, hydrangeas, and sweet peas – all in hues ranging from cream to cerise. A classic multi-tiered cake was the focal point of the room. 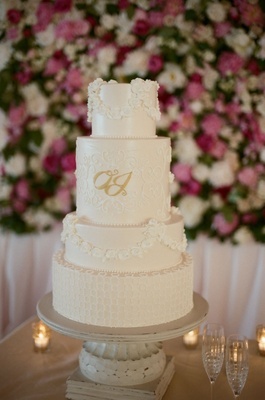 The elegant ivory confectionery featured floral piping and the couple’s monogram in a golden hue. Following dinner and dessert, guests made their way to the lounge area to join Olivia and Jack in dancing and merriment. Large lanterns decorated with floral bunches were suspended from the ceiling over a large white dance floor with a personalized inscription resembling the couple’s save-the-date. 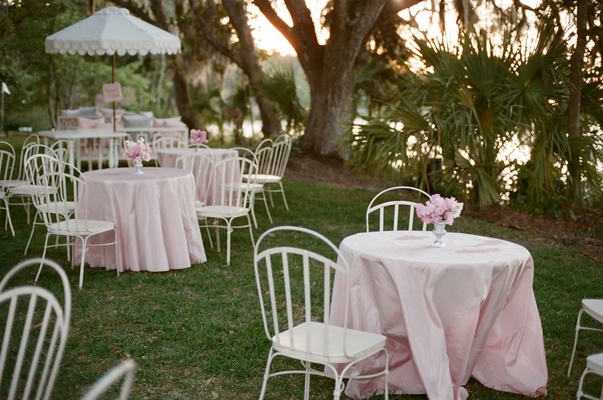 Comfortable chaises and chairs offered rest areas for guests, and a s’mores bar set up on the porch pleased those attendees with a sweet tooth. 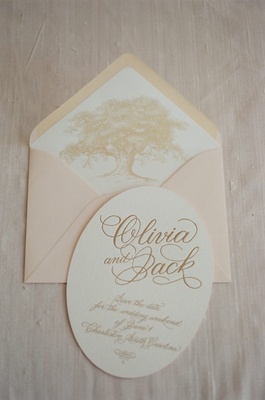 Olivia and Jack agree that they wouldn't change a thing about their special day. "Although you may think it's all up to the bride, it is special when you look back and realize how much the celebration reflected you both," explains the groom, who encourages other men to get involved in planning. 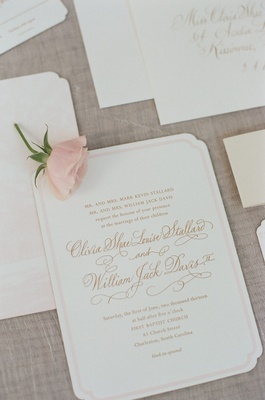 "Jack was involved in every aspect of the planning process," confirms the bride. "Except the excessive pink..." she adds with a smile. Laughs Jack, "I didn't have a say in that."